After the First World War had come to an end it didn’t take long for football clubs to start reaching for their cheque books. The first new record saw Sheffield United regain the status of fielding the most expensive player when they splashed out £4,500 to capture DAVID MERCER from Hull City. Outside-right Mercer was 27 at the time of the deal. Born in the rugby league stronghold of St Helens, he had begun his career with Prescot Athletic before joining Skelmersdale United of the Liverpool County Combination whilst working as a miner. Hull signed Mercer in January 1914 for a fee of £40, with the non-leaguers promised an extra £10 should he graduate to the league team. He made his debut three months later and would play in 218 consecutive matches including 142 wartime fixtures. Dubbed ‘Magical Mercer’ by Tigers fans, he was a huge favourite at Boothferry Park but they were regular sellers of their top players to bigger clubs and it came as no surprise when they accepted the record £4,500 bid from the Blades. Mercer quickly became an important part of the United team and he won an F.A.Cup winners medal in 1925. He also played briefly with brother Arthur at Bramall Lane when the club signed him from Bury in 1926. He was capped twice for England whilst with United, first in a 2-0 win over Ireland at The Hawthorns in 1922 and then in the 1923 game at Highbury against Belgium when England recorded a 6-1 win and he got on the scoresheet. The next big move was the first £5,000 transfer, and it was one that shocked football. Every record move so far had seen the player end up at an English club but in February 1922 West Ham United sold striker SYD PUDDEFOOT for £5,000 to Falkirk. Puddefoot, born in London’s East End started out with Limehouse United before joining the Hammers in 1912, initially as an amateur before turning pro the following year. He spent 10 War-interrupted years at the club and scored over a century of goals, also playing championship cricket for Essex. The forward spent most of the war working at a munitions factory which made him available for the Hammers London Combination matches until late in the conflict when he was called up to the army. Once he had joined the forces Puddefoot spent some time stationed at Bridge of Allan in Stirling and while he was there made some guest appearances for Falkirk. In the 1921-22 campaign he finished as West Ham’s top scorer despite leaving the club in February, when Falkirk offered an unprecedented £5,000 for his services. Part of the transfer fee was raised by fans who set up a public fund. West Ham fans were irate at the loss of their star but the club blamed the player, claiming in a statement that he wanted the move because he would be ‘branching out in commercial circles in Falkirk’. Puddefoot would later say that it was the club who pushed for the move and he complained that, in Scotland his teammates refused to pass to him. Despite this, he managed 45 goals for the club until, in 1925 he moved back to England, joining Blackburn Rovers for a £4,000 fee. At Ewood Park he won two England caps, and was part of the Rovers team that won the F.A. Cup as underdogs against Huddersfield Town in 1928. Puddefoot spent a total of seven years with Blackburn scoring 87 goals for the Lancashire club before, aged 37, he returned to West Ham. Puddefoot spent a season back in London, trying in vain to help the Hammers avoid relegation from the 1st Division before accepting an offer to coach in Turkey, first with Fenerbahçe and then with Galatasaray who he left after being ‘manhandled’ whilst trying to break up a fight between players and spectators. After the melee 17 players were suspended. On returning to England he spent some time working as an F.A. coaching instructor before taking up an offer to manage Northampton Town. He won 41 of his 91 matches in charge before leaving in a disagreement over club policy. Puddefoot later worked for the ministry of pensions before joining Southend United as a scout. He passed away from pneumonia in 1972 at the age of 77. In fact Puddefoot’s transfer to Falkirk was the record fee for a mere month. In March 1922 Sunderland bought WARNEFORD ‘WARNEY’ CRESSWELL from South Shields for £5,500. Born in 1897 in South Shields, Creswell represented Durham schools and won an England schoolboy cap before cutting his early footballing teeth in Scotland. Top-class English football was suspended during World War One but it continued north of the border and Creswell represented Morton, Heart of Midlothian and Hibernian as a teenager before enlisting in the army. Whilst serving as a gunner with the Royal Field Artillery he made some guest appearances with Tottenham Hospital before being posted overseas, captured and interred in a prisoner-of-war camp. On his return Creswell signed for his local team, South Shields (later Gateshead) who had been awarded a 2nd Division place when the Football League was expanded. He spent two-and-a-half seasons with his home town team as they battled to get into the top flight but in March 1921 he fell into dispute with the club after Burnley had a £6,000 offer for his services rejected and South Shields suspended him. He stayed at the club for another year but in March 1922 Sunderland successfully bid £5,500 and he moved to Roker Park. Known as ‘The Prince of Full Backs’ Cresswell played a part in the team’s runners-up position in 1922-23, was appointed captain of the Black Cat’s in early 1924 and led the side as they constantly challenged, but just failed, to take major honours. Creswell made his England debut while still at South Shields, in a goalless draw against Wales in 1921. 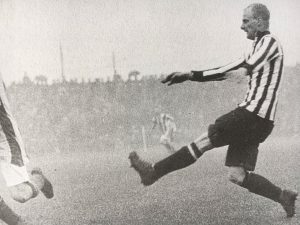 He went on to win a further five caps during his time at Sunderland with his final appearance coming after he had signed for Everton for £7,000, a hefty price for a 30-year-old, in 1927. It was at Goodison that Creswell enjoyed his greatest spell, being a key member of two title-winning sides, including one in his first season, and gaining an F.A. Cup winners medal in 1933 as his team overcame Manchester City where his performance was described as ‘almost perfect’. At the age of 38 Everton finally released him in 1936 after almost ten years service and more than 300 appearances with the Goodison Park club. He was an extremely popular figure at all the clubs he played for and during his prime was the undisputed best player at his position in the country displaying coolness and tremendous positional sense, being a fine tackler and more than capable of supporting the players further forward. He was also known as a fine sportsman and once turned up at the hospital to visit an opponent whose leg had been broken after a collision between the pair with a pouch of tobacco as a gift. After retiring Cresswell spent time as a manager with Port Vale, Northampton Town and Dartford. When he left the game he became licensee of the Sheet Anchor pub in Sunderland. Cresswell wasn’t the only member of the family to make his mark on the sporting world. Brother Frank also played for Sunderland, son Corbett won the Amateur Cup with Bishop Auckland and great-granddaughter Kate Haywood was an Olympic swimmer. The transfer record stood for over three years and when it was broken the player who took Cresswell’s place joined him at Sunderland. Lancastrian BOB KELLY was born in 1893 and spent his teens playing with local clubs Ashton White Star, Ashton Central, Earlestown Rovers and St Helens Town whilst working as a miner. He didn’t break into league football until he was 20, joining Burnley for a £250 fee and helping them finish 4th in his debut season. Within a year of his signing for the Turf Moor club though, war broke out and Kelly joined in the Royal Artillery, seeing action in France in 1917. On his return to the club Kelly quickly made his mark, playing at inside-forward and ‘with an innate ability to ghost past opponents’. Such was his form that in 1920 he was chosen for the England team to play Scotland at Hillsborough and scored twice in a 5-4 win. He went on to win 11 caps while with Burnley, scoring six times for his country. 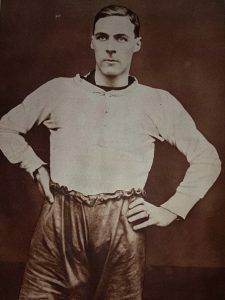 He also played a major role as Burnley went on a 30-match unbeaten run and won their first-ever Championship in 1920-21 after a 2nd-place finish the previous season. Kelly was married on 24 March 1924 and later that same day helped his team win an F.A Cup quarter-final replay against Swindon Town then played for the Football League a few days later before going off on honeymoon. Burnley would miss out on the Cup final at the last-four stage to Aston Villa. The inside-right made almost 300 appearances for the Lancashire club where his name often comes up alongside Jimmy McIlroy in conversation regarding their all-time greats. He scored 88 goals before in December 1925 Sunderland made a bid of £6,500 which Burnley accepted. Kelly spent only 14 months at Roker Park before he was on the move again, this time joining Huddersfield Town for £3,500. There, he earned runners-up medals twice in both the 1st Division and the F.A. Cup. He made one final England appearance during his time with Huddersfield, scoring his country’s only goal (and becoming his country’s oldest goalscorer) as the team were blitzed 5-1 by Scotland’s legendary Wembley Wizards with clubmate Alex Jackson scoring a hat-trick for the Scots. 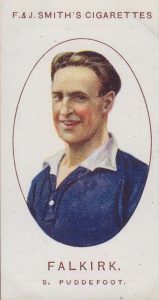 Kelly moved again in 1932, joining Preston North End where he spent three years as club captain before joining Carlisle United as player-manager. He stayed at Carlisle until 1936 when he left to take over at Stockport County who he managed for 18 months before taking over as licensee of the Woodman Inn pub in the town. 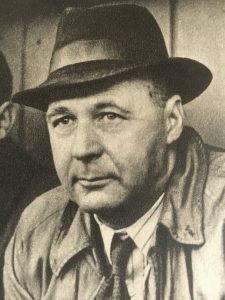 After World War Two, Kelly worked abroad coaching Sporting Lisbon in Portugal, St Gallen in Switzerland and Heerenveen in Holland before returning to the UK in 1960 to take charge at Barry Town. He passed away in 1969, aged 75. Kelly’s record as the most expensive player stood for almost three years. When it was finally exceeded it wasn’t broken so much as smashed. Bob would eventually move to the West Country to manage Plymouth Argyle and this is where young David, along with brother Robert, started out his own professional football journey after initially turning out for Plymouth Presbyterians. Prior to this Jack Jnr had served in the Royal Navy during the 1st World War. He played for the Royal Navy football team and also guested for Chelsea. He soon showed the potential to perform at a higher level and Arsenal, Sheffield United and Chelsea expressed an interest in signing him. But he chose to go back to the North West, signing for Bolton Wanderers who paid £3,500 for his services. It didn’t take long for Jack to establish himself at Burnden Park and in 1923 he carved his name into the history books by scoring Wembley’s first goal as Bolton won the stadium’s first F.A. Cup final, beating West Ham United. In 1924 he made his England debut but after going scoreless in two matches he was dropped and wouldn’t get back into the national team for four years. But Jack continued to excel for Bolton. He got the only goal in the 1926 F.A. Cup final to earn his second winners medal and would finish top scorer in five of the eight years he spent at Wanderers finishing with over 150 goals at almost a goal every other game. He reappeared in the England team in 1928, playing in the wins over France and Belgium and scoring in the former match. In October 1928 Arsenal smashed the transfer record laying out an enormous £10,890 for Jack, an amount made even more astounding given the fact that he was already nearing 30. F.A. president Sir Charles Clegg was among those outraged by the amount spent claiming ‘no footballer is worth that much money’. Arsenal manager Herbert Chapman on the other hand would later call Jack ‘one of the best bargains I ever made’. He was a ‘signature buy’ for the club and Chapman, and actually his boss was proved right as he became a cup winner with two clubs when playing in Arsenal’s Wembley-winning team of 1930 and would go on to be an integral part of three pioneering title-winning sides. When Arsenal became the first southern team to lift the 1st Division crown in 1930-31, Jack scored 31 times in 35 games as Chapman’s new ‘W-M’ tactics befuddled opponents. Perhaps even more than this, his signing, along with those of Alex James, Cliff Bastin and others after the appointment of Chapman cemented Arsenal’s place among the game’s super-powers. Jack left Arsenal in 1934 and hung up his boots having played almost 200 games and scored over 100 goals. He departed to take up the role of Secretary/manager at Southend United. By then the team he left behind were firmly established as one of the country’s top teams. At Roots Hall, he never managed to get the club out of the 3rd Division (South) and he resigned when top-class football was suspended at the outbreak of the 2nd World War. He worked in a bank during the war and was transferred to a branch in Sunderland where he also became manager of Sunderland Greyhound track. In 1944 Jack was named as manager of Middlesbrough, a post he held for eight years before resigning due to his wife’s ill health. He spent a couple of years with Irish club Shelbourne in the mid-1950s before retiring. David Jack passed away in St Thomas’s Hospital in Lambeth on 10 September 1958. Perhaps the biggest surprise about his long and illustrious career is that he made only nine appearances for England, captaining them four times and scoring three goals. Jack’s record as British football’s most expensive player stood for some time but it was broken once before the 2nd World War, and again it was Arsenal doing the spending, although this time it didn’t work out so well though neither club or player could be blamed for that. BRYN JONES was born on Valentines Day 1913 in Merthyr Tydfil and spent the early part of his football career playing for minor teams Merthyr Amateurs, Plymouth United, Glenavon of Northern Ireland and Welsh Leaguers Aberaman Athletic. Jones was a member of a footballing family. Four of his brothers played professionally as well as three nephews, most notably Cliff, who would become a double winner with Tottenham Hotspur. In 1933 Wolverhampton Wanderers paid a healthy £1,500 for the mostly untried 21-year-old. 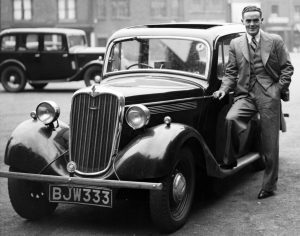 In five years at Molineux, Jones proved a shrewd purchase and even more so in 1938 when Arsenal, searching for a replacement for Alex James, shattered their own British transfer record paying Wolves £14,000 for Jones’s services. Jones was picked for his country for the first time while with Wolves and would go on to play 17 times for Wales, scoring five goals. He also played in eight wartime internationals. The inside-forward got to enjoy a single full season with the Gunners before the 2nd World War broke out. He started that season well, scoring in three of his first four matches before his form dropped off and the Gunners finished a disappointing 5th. The following year Jones left to become player-coach at Norwich City. He stayed at Norwich for three years before retiring and returning to London to run a newsagents shop close to Highbury. Bryn passed away in 1985 aged 73.